2007 October Archive « .Evolving Music.
. 1 Comment Tags: Bridge School, Bridge School Benefit, Chamber Rock, collaboration, Jerry Lee Lewis, Kronos Quartet, Metallica, Neil Young, Shoreline, Tegan and Sara, Tom Waits. Over here, we like it when things are thrown together and stirred around for a new outcome. And nothing says “mix and match” like the annual Bridge School Benefit held every year at Shoreline Amphitheater in Mountain View. Started by Neil Young as a fundraiser for the Bridge School, a school focusing on the education of children with very specific needs, the benefit is always one of the highlights of the concert season. Because of several of the basic principles of the Bridge School and the benefit, the event always turns into a sharing and communal concert celebrating life, happiness and the pursuit of education. As for the mixing and matching…take multiple well-known and wealthy musical artists. Sprinkle in some lesser known artists that deserve some spotlight. The resulting line-up always covers an incredible spectrum of genres, and as a result, brings in one of the most diverse and eclectic concert going crowds you might ever see. Then, you make all of the artists, even those known for rocking hard, switch to acoustic for the event. Finally, you have all of these musicians and music fans coming together to support and donate to children that, for the most part, they could never imagine being in the shoes of. So just how diverse are the musicians? This year’s show featured Regina Spektor, Tegan and Sara, My Morning Jacket, John Mayer, Tom Waits with the Kronos Quartet, Neil Young, Jerry Lee Lewis and Metallica. Yes, Metallica, at an acoustic show. I missed Regina Spektor’s set. Eddie Vedder and Flea were supposed to play after Tegan and Sara, but due to personal problems of Vedder’s, they had to cancel and were replaced by My Morning Jacket. I have never heard of this group before, and if the set they put together yesterday was any indication, I never want to again. John Mayer, at least in my personal opinion, falls into that annoying category of singer/songwriters that succeed due to mass marketing, cheesy songs, romantic expectations and a sound simple enough that the general public goes, “oooh, this is really good!” Someone tried to compare Mayer with Dave Matthews at one point, and I almost threw that someone off a balcony. The lyrical depth isn’t even close. The guy that sings the “Had a Bad Day” song, John Mayer and Jack Johnson should get together to form a pop sensation super band in which all 102 songs of their catalogue sound vaguely similar and they go quadruple platinum because of how easily digestible their music is to the public. But hey…that’s just my opinion, right? For the set, it’s Mayer and two other guitarists. Mayer comes out trying to act very relaxed and nonchalant, sits down on a stool, gives a raspy “How you doing out there?” to his female admirers, and proceeds with a set that sounds like a frat boy playing guitar in the middle of campus hoping to get noticed, if not laid. He pulls out the same raspy voice on the majority of his vocals, I can’t tell the difference between the songs other than slight tempo changes, and while they try to disguise it with tricky camera work, every guitar solo of even remote musical complexity is done not by Mayer, but by one of the other two guys on the stage with him. I’m about to give up the set as a complete washout when he closes it by covering “Free Fallin.” It’s a nice touch, but he comes dangerously close to screwing this hallowed classic up by failing to sing the chorus with anything remotely resembling Petty’s range and energy. If you ever want to listen to John Mayer, I suggest going down to your local campus and looking for a guy playing guitar…he may not be as well known, but hey, he could be the next John Mayer, and if not, he’s certainly more affordable to see in concert. Following Mayer we have Neil Young. First off, you can’t say anything negative about his set because he puts on the event, his songs are as old as the Amphitheater itself, and he’s always Neil. You can’t say much positive though because bands have a tendency to lose their effect after multiple shows. Neil plays at every Bridge School, so I think I’ve probably seen him 8 or 9 times now. He’s solid, and you have to give him one thing…he’s extremely consistent. The only thing he didn’t break out last night was the big stand-up organ I’ve seen him use from time to time, but this is probably due to the fact that he usually closes the show and this time went in the middle of the sets. I don’t recognize any of the songs, but at the end he tells the crowd that it’s mostly new material and he doesn’t expect anyone to have recognized any of it. Next up is one of the primary reasons I bought tickets for this Bridge School, and the performance of Tom Waits and the Kronos Quartet delivers. For those of you who don’t know the Kronos Quartet, they’re the group that performed Clint Mansell’s arrangements for Darren Arronofsky’s movie Requiem for a Dream based on Hubert Selby’s book. But when you mix a legendary, eccentric and out there rocker like Tom Waits with an incredibly proficient and polished string quartet like Kronos, the outcome is something spectacular. I’d almost want to dub this Chamber Rock. They come out and open with the theme song from HBO’s The Wire, which is stellar. He also plays some old time blues songs with the Quartet behind him straying into some dark and menacing arrangements. He plays a variety of songs with completely different sounds. One sounds like a Gotan tango song laced with arsenic, and one takes on the style of a macabre show tune. There aren’t a whole lot of succinct words to describe this performance, but it was one of the more interesting musical collaborations I’ve seen and ranked right up there with last year’s Trent Reznor/string quartet performance (although Trent didn’t use Kronos, so he loses some points there). After Waits leaves, I feel like the energy in the place is knocked up a few notches, and I’m wondering if they can bring him out for another set. All in all, it wasn’t the most impressive Bridge line-up I’ve ever seen…My Morning Jacket and John Mayer could have definitely been left off the guest list. But seeing Metallica acoustically, Jerry Lee Lewis for the first time and the unreal performance of Tom Waits and the Kronos Quartet made this a very successful, diverse and memorable Bridge School Benefit. See y’all next year.
. 0 Comments Tags: American Idol, Blue Scholars, Emerald City, hip-hop, Immortal Technique, music, Northwest, pop, pop music, Seattle, underground. There’s garbage floating around out there. It’s in the bottled water, and people keep drinking it. Every once in a while, I understand a sip, but the massive thirst for this garbage water is becoming unbearable. Of course, it’s easy to become addicted to a certain type of water when you really don’t know any better, or perhaps don’t want any better. And when all the brands of water taste the same, what does it matter what bottle you drink from? And why wouldn’t you buy it? Well, the bottled water companies here are the record labels and radio stations, obsessed with putting out a consistent product that keeps the masses drinking. In the process, musicians and artists are funneled into a series of water bottles, the shapes and sizes of which can vary, but the general taste of which remains the same. So, left with not much other choice, you keep flipping on the radio and drinking Pop. I don’t blame you…like I said, I take a sip sometimes too, it’s what we’ve been raised on, like fluoridated water, but it’s easy to forget that you can bypass the bottled water and get to the source sometimes. Let’s be honest people, when a show like American Idol draws 30 million viewers a week in order to crown the next great radio star from a host of characters that couldn’t even launch the idea of a musical career without a free-for-all reality program catering to the masses, we have a problem as a music listening population. I’ve got an idea…let’s let everyone in the world, regardless of talent or skill, compete by singing copies of Pop radio songs, and the person who is the least offensive and most popular to the people that watch this show and listen to Pop 100 on the radio can launch a recording career, make more bad pop songs and sell records. When I put it that way, doesn’t it insult your musical intelligence? Doesn’t it offend you that 90% of the music you hear out there all sounds the same and is mass market pumped to you through the iTunes collective? If it doesn’t, you can stop reading here and go back to sleep…MixMatch is about changing the way music is made and the way it sounds, not sitting idly by and buying the new “Single of the Day.” I’ve heard people say that they watch the show, but wouldn’t buy the album. This is like saying you don’t support the steps taken by our government to secure cheap oil while complaining about how much it costs to fill up your 2 miles to the gallon SUV. You might not be directly responsible for the problem, but you’re contributing to the means that lead to the end. We’re still overseas and you’ll still be hearing that artist on the radio for the next two months. So who shows more intelligence? The viewers that promote this kind of annual activity by spending their time and money on it, or the media moguls who have realized that no matter how many times you repackage the same thing, the majority of Americans raised on the radio are going to buy and buy and buy. And yet every season, new contestants arrive, millions tune in, and record companies make massive amounts of money funneling us a “new ” version of radio music we’ve heard 50,000 times in the past 10 years. But I digress…the point was Emerald City. Because some of the most authentic and creative sources are so forgettable, we have to keep spreading the word and reminding ourselves that there are other drinking options out there. One of the premier out of bottle drinking experiences now and for the last 15 years has been the consistently overlooked, under-appreciated and sparsely marketed underground hip-hop scene. Sure, CDs and mp3s still float around, and there’s some consistent word of mouth when an underground artist rises to the surface, but all too often, incredible DJs and MCs stay underground, sometimes leaving us with less than we deserve. For instance, one of the artists right now that exemplifies the fight against the mainstream record label, the need to speak honestly about the state of politics, the media and the record industry is Immortal Technique. And yet, because labels are trying to tone down his message, he stays off them, and remains underground. And you deserve the underground of Seattle. Yes. I said Seattle. The City of Rain isn’t just for Starbucks (scary stuff people) addicts, Seahawk fans, or long-haired flannel wearing musicians with the urge to turn their brains into a Jackson Pollack painting anymore. The indie (not grunge, indie) scene is pulsing with new musicians interested in turning the surroundings into a musical tapestry of depression AND hope. I thought a band like Throw Me the Statue showcased Seattle music at its best. Hip-Hop? You can find that in the Bay Area, LA, various havens on the East Coast. But not Seattle, not since Sir Mix-A-Lot or outside of the Lifesavas anyway. Or so I thought. 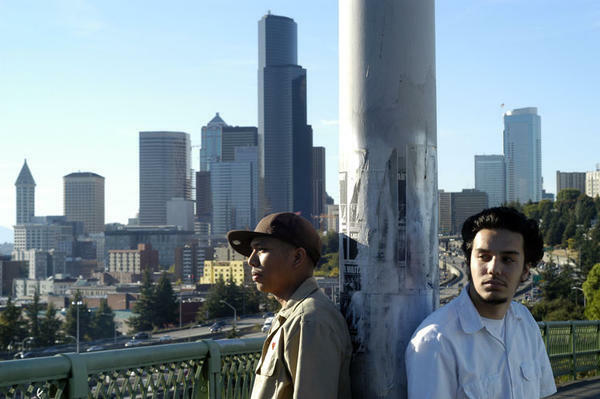 Always exposed to new things through the IndieFeed Hip-Hop collective, I was recently turned onto Blue Scholars, an underground twosome from the Northwest with two albums for you to sink your ears into. As with most prolific and worthwhile underground artists, the personal stories of the artists play an enormous role in the music they make, and the Blue Scholars, a play on blue collar, let their history and surroundings saturate every beat and line of their two cds, the 2004 release Blue Scholars and this year’s Bayani. They’re the answer to that question you have long contemplated but maybe never thought to ask…What do you get when you mix a Filipino rapper and an “Iranian American jazz-trained pianist” turned DJ? The result is a large spectrum of beats ranging from melancholy drifters to jazzy car cruisers, and lyrics examining the social, economic, and political systems in existence here in the United States. But when not tackling the socioeconomic divide, they still have the time and the skill to put together laid back summer day tracks that you can imagine coming out of stereos in the streets or from passing car windows. What’s interesting in discovering these two albums at the same time, produced three years apart, is noting some of the similarities while also being able to see how far the group has come in their personal and musical mission. On Blue Scholars, the group sounds like your fundamental backpack crew. The delivery of the lyrics is laid back and easy to follow without sacrificing complexity of subject matter or rhyme scheme. Even on the songs with less of a message to send carry a sense of urgency to be heard. The beats are of a lower production value, giving it the basement studio sound, but still contain musical hooks and phrases that you can’t stop listening to. In short, it’s your typical stellar yet underfunded debut album from an underground hip-hop group. The subject matter tackles their origins as a group, their personal connections to the working class and life for a Seattle transplant. Bayani, on the other hand, shows what three years can do to the growth and development of a musical sound. They come out sounding more secure, more focused and more intent on being heard. If Blue Scholars is a whisper from the basement, Bayani is a shout from the rooftops. Some of the more typical hip-hop beats of the first album are abandoned here for more complicated beats incorporating jazz and world sounds. The beats by Sabzi here are of a much higher quality, creating a more perfect tapestry for Geographic’s tightened and more lyrically calculated flow. You see glimpses of what he’s capable of as a lyricist on the first album, but the second album shows off just how talented he is in mixing potent wordplay, social observations and governmental condemnations into complicated phrases that roll off his tongue. So if you’re looking for some solid underground hip-hop from an unusual geographic location, look no further. It’s only fitting that an MC named Geographic could help make the traditional locations of genres irrelevant. Remember, when we change the way music is produced and recorded, we can change how it is distributed, where it comes from, how it becomes profitable, and who takes home that profit. So put the water bottles down good friends, go find that fresh water and take a sip…if it’s slightly strange at first, don’t be alarmed, give it time…we’ve been drinking garbage for so long.
. 2 Comments Tags: Coachella, concerts, G. Love, Gotan Project, Jack Johnson, JamBase, Last.fm, live music, LiveNation, Pandora, Pink Martini, shows, Songkick, Thievery Corporation. Most of us like a good live show once in a while. Though I’ve never been fanatical about concert-going or following any one band around the country, I do get surprised every time I go just how intense the experience can be. Whether it be a jazz trio in a smoky lounge, a jam band in a beer can littered park, or a punk show with a leg-breaking mosh pit, each experience has its charms. But ya. Seeing the band(s) you love live and sitting amongst other blubbering wide-eyed fans definitely has its merits. When I saw Pink Martini live a few years ago, I think I cried through basically the whole show. Gotan Project and Thievery Corporation had me dancing at the front like a total psycho*. These days, though, I rarely take the time to keep track of who’s playing, where, and when. Luckily, there are a host of websites which can do that for you. JamBase is one. They’ve been around since 1998, but I was reminded of them recently, when another MixMatcher and I attended the SF New Tech meetup in San Francisco. JamBase was one of the featured presentations and after seeing them in action, I realized that they can make concert-going for us lazy busy people more feasible. Their comprehensive tour date search engine of over 40,000 bands should be a good start anyway. Other goodies include in-depth reviews, networking with other fans, listings of shows in your area etc. Check em out. Obviously, they are not the only player in their field. One contender, which I found on TechCrunch, is the new startup Songkick. It helps you find the cheapest concert tickets – definitely a winning idea in my book. You can also track shows and blog posts about your selected entertainers, and there is a recommendation engine, which is “not generated from the user base, like Last.fm, or through careful analysis like Pandora.” Another alternative is LiveNation, which claims to be the “world’s largest live music company”. Given the seemingly endless number of startups popping up every day, it’s hard to keep track of what’s what. My opinion about startups is generally based on their answer to the question “how will you make my life easier?” as well as secondary concerns like “how pretty is your website?” and “can you keep my attention for more than 30 seconds?” In this regard, JamBase has my vote. For now, anyway. *My psycho dancing is nothing compared to the thousands of teeny bopper girls I watched morph into screaming hyenas at that one Backstreet Boys concert I got dragged along to years ago…I kept thinking poor chaperoning parents. Yet, oddly enough, many of them seemed just as excited to be there as their 3-13 yr olds. Admittedly, I may have kind of gotten into it too. Just a little. Sure, You Can MixMatch…But Can You Mix?
. Closed Tags: Bay Area, collaboration, fuzz, fuzz.com, garage band, mix tapes, mixtape, music. In what can only be called an avalanche, the world wide web is being buried under the stampeding snow of social networking sites. Myspace, facebook, hi5, friendster, linkedin…all of these seek in one way or another to organize your many relationships, quantify and qualify them, then help you make more by spying on the profiles of all the people you know or would like to know through a friend of yours. This way, you can not only be friends with the people you know, but you can stalk them effectively too! As we’ve been over numerous times, MixMatchMusic carries the goal of introducing musicians to each other through the site, and then allowing them to share, swap, compose, compound and create new music using not just the power of collaboration between musicians, but also harnessing sequencing abilities to use all the music on the site to make what you want to hear. The primary and important goals of MixMatch revolve around introducing people to new sounds and musicians and allowing them to create new music and ideas using 2.0 infrastructure and the power of new sounds and ideas. Also coming out of the Bay Area is the new start-up, Fuzz.com. Luckily for all involved, Fuzz’s goals do not conflict with MixMatch, but rather supplement them. I bring you Fuzz.com today because they have a very interesting new tool that could be a lot of fun to use…the virtual mixtape. Remember when we all used to make mixtapes for each other? Then it was mix CDs, and now it’s like, “here, try my playlist!”…well, the good folks at Fuzz.com have created a way for you to upload your mp3s, make a mix tape (complete with customizable mixtape artwork!) and then send it to friends who can also download your music. For someone who was a huge mixtape maker back in the day, this tool is not only very neat, but also, in my mind, a wonderful juxtaposition of old school style with new school techmology. The idea behind Fuzz is a site that allows musicians and friends of musicians to interact in a social network atmosphere through uploading music, blogging, reading and writing reviews, talking about upcoming shows and sharing music. It’s basically Myspace for music lovers, whereas MixMatch is like an online collaborative GarageBand. I see a beautiful future where artists from all over the globe come to MixMatch to find other like minded musicians, creating new and interesting collaborations of genre and sound. Following the release of their MixMatchMusic based CD, they trot happily off to make a profile on Fuzz.com as a full and complete band, spreading the word of their release and upcoming concert tour through the musical social network. Of course, by that time, MMM will have most of the same components in place AND allow you to create music online, but they’re great people for trying, and just the type of website that the MixMatchers see working with in the future.
. Closed Tags: backpackers, gangsta rap, genre, hip-hop, Indie Feed, Indiefeed, Planet Asia. We all know hip-hop. We also, for the most part, know that this type of genre, like almost every genre, has many sub-divisions to more clearly classify the type of music we’re listening to. But down the genre of hip-hop, there has been a traditional and deep divide between the backpackers and the street rappers or gangster rappers…a divide often accentuated by underground v. commercially signed artists, thought provoking lyrics v. lyrics about money, guns and women, and melodic relaxed beats v. club bangers. But recently, the Bay Area artist Planet Asia has decided that there’s not enough room in these two separate and narrow definitions for certain types of hip-hop, including his own brand, and he has therefore coined the term “Street Hop.” He introduces it on a track of the same name off his most recent album The Jewelry Box Sessions. The idea behind Street Hop is a genre that both the backpackers and the gangsters can enjoy…something that carries the lyrical intelligence and sound of underground over some of the heavier beats that will get the club going. Because there has traditionally not been much overlap between these two genres, the attempt to define and emulate it from Planet Asia should prove to be a launching point for others that don’t feel their songs quite fit one style over the other. For those of you looking to add a little hip-hop to your life, I suggest searching for IndieFeed Hip-Hop on iTunes. You can download single serving hip-hop songs with brief descriptions of the artists and their albums. Of course, if you’re lazy, you can also just click here and go right to the site. If you’re looking specifically for the Planet Asia song Street Hop, you’re covered.